SMT total-coverageTM packings are designed for usage from analytical to process scale purification. The primary purpose for analytical method developments in pharmaceutical and food industries is for subsequent process scale purification. The analytical steps are used to reduce the costs incurred in erroneous large-scale purification steps. SMT is a spe¬cialty column company, and as such, offers services that can greatly enhance scale-up of many analytical methods devel¬opment. Ask Rose Scientific about bulk samples for initial evaluation. 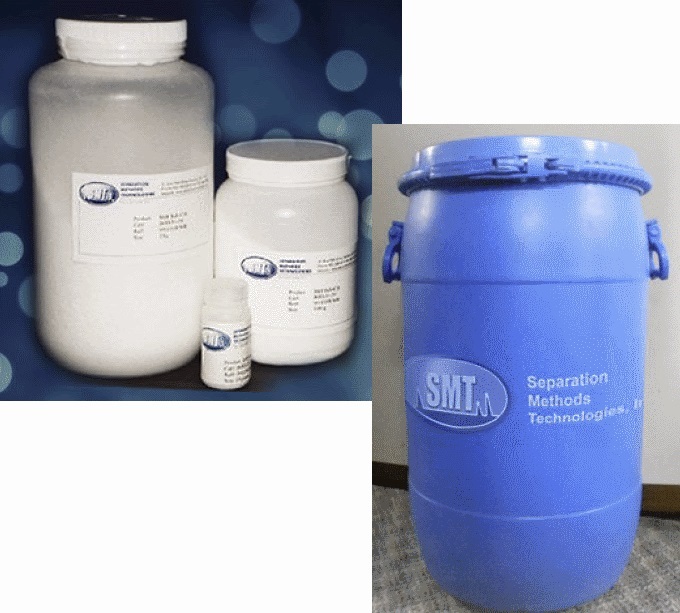 SMT offers a variety of packing materials in bulk quantities for reversed-phase, normal phase, and ion exchange chro¬matography. These B- series bulk packing materials usually consist of silica substrates and are made with total-coverage™ technology and guaranteed to last much longer than com¬petitors’ silica-based packings. SMT polymer based packings are available for special applications that require use in extreme pH conditions (such as pH=14).